We've all met people wishing to change career, often after the Summer holidays or New Year - 75.7 per cent of UK professionals wanted to do the same at the start of 2018. Yet when we meet them a few months (or years) later nothing has changed. What stopped them – and possibly you? Our retiring later, increasing family/caring commitments and rising job insecurity mean more and more of us are having to consider changing career once, twice or three times in our lives. But how do we make career change work? Joining this webinar will answer these questions, helping you move past the confusion, doubt, fear and uncertainty often associated with career change; give you the seven vital elements to keeping focused, motivated and happy during career change and share examples of women like you making their career change ambitions happen. At 29, Amechi experienced an unexpected redundancy. He had no job, no home, and no clue as to what the next career step was. The career advice he had learned at school and university was outdated. 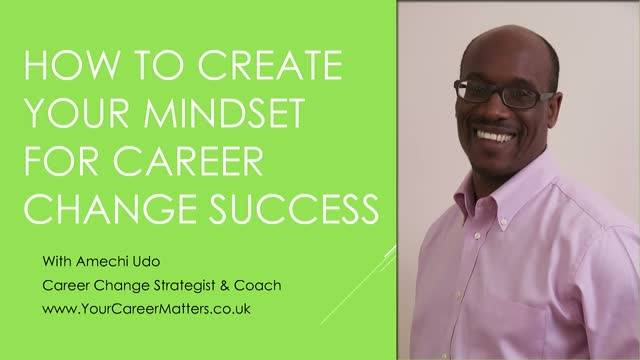 In figuring out how to make a successful career change Amechi met many men and women facing the same midlife career challenges. Since then Amechi has coached and trained people internationally in successfully making career changes through his company, Your Career Matters. A firm believer that life's too short to be unhappy at work, Amechi's clients value his ability recognise the talents, abilities and opportunities they have overlooked and show them how to transform these into the platform for career change success.